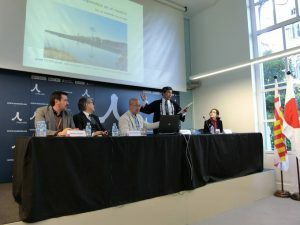 “Let’s Talk” Ambassador to korekara japon, Barcelona! Let’s Talk Foundation has been working on dispatching themselves from Komo’s English Reading Club at Rikuzentakata who has been participating in some ways to build and maintain relationships with overseas countries and areas. 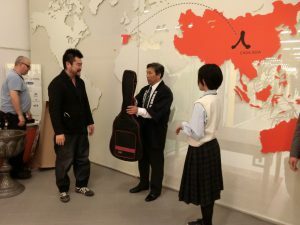 We call this the ‘Let’s Talk Ambassador’ program because of the concept that they represent the Tohoku affected area and our whole community as well as depending on the bond and expand it in a circle of people. We brought Teiichi Sato who is the owner of Sato seed shop who has been broadcasting the information all around the world by writing the earthquake disaster notes in English in the early summer of 2014 in Taiwan (Sato Teiichi Taiwan visit). The subject of Sato visiting Taiwan was to thank Taiwanese people who supported us so much in various ways after the disaster. He revised the English notes in Chinese in a monkey see monkey do style and traveled to a few places around Taiwan as well as practicing his reading out in Chinese. Also, in the summer of the same year, Yuuka Kumagai (she was a first year student of a junior high school back then) went to Barcelona in Spain visiting her pen pal (Kumagai Yuuka Barcelona visit). We decided on dispatching some people who have continued writing letters to each other for more than a year. In the spring of 2016, the second overseas dispatch of ‘Let’s Talk Ambassador’ became real. It was from March 29 to April 2 in 2016 and they went to Barcelona in Spain again. 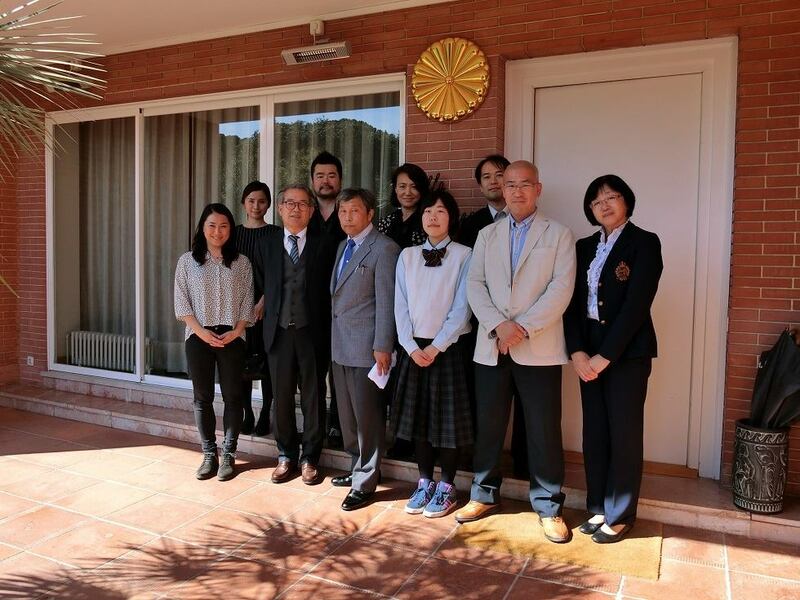 Teiichi Sato again and Yuki Konno (first year high school student) visited Spain. Sato visited there to thank people who supported us. Konno visited after exchanging letters with illustrations for over a year. During their stay, they had a few opportunities like multiple speeches, presentations, reunions and interactions. The large context for our foundation has a special bond with Barcelona. In Barcelona, there are quite a few people who felt about the affected area in Japan straight after the disaster, thought about us, cheered for us and supported us. Between them and our English Reading Club at Rikuzentakata, we had greeting cards with a lot of people because of Reiko Ishimatsu who is a teacher of Japanese culture school in Barcelona with her school, in return, we returned a message board of everyone’s messages written from Rikuzentakata to interact. Among those, Yuuka Kumagai and Yuki Konno started exchanging letters. 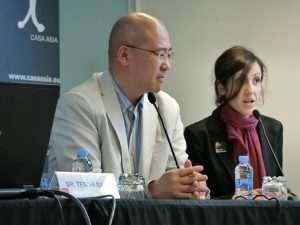 In terms of Teiichi Sato, since his English notes on the earthquake disaster “The Seed of Hope in the Heart” was released for the first time in March 2013, now the fourth edition exists after repeated revisions. Also, the content was published digitally in 2015, it has been broadcasting information literally all around the world. The echo from the world is still big and there are some visitors to see Sato all the way to Rikuzentakata. This time, Sato who has never learned Spanish before made a presentation in Spanish again from the English notes about the disaster. He made an amazing presentation with his Spanish reading he practiced a few millions of times with volunteer’s help to connect sentences. I seriously take my hat off. I think I’ve never seen cases like this how the actual victim broadcasts in a foreign language to the world. 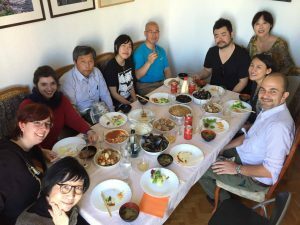 Konno stayed with a homestay family. It was Marina’s who Yuuka Kumagai’s stayed for a homestay the year before. Yuki Konno made an English speech very well at bonsaikebana event on Wednesday the 30th of March. It was her first time to visit overseas and the first English speech she ever made. She seemed very nervous, but I’m sure that it was an unforgettable experience for her. Also, we had donations from people prom ‘Run for Let’s Talk Foundation (blog in Japanese)’ that is a group of marathon fans for some of the traveling expenses and accommodation fee for Konno. 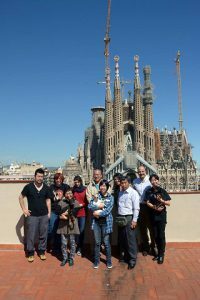 The money fundraised by our members who participated in the marathon and donations saved from daily running were used for Konno’s Barcelona visit. 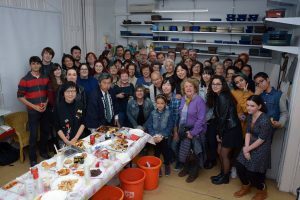 The visit to Barcelona this time was realized because of a lot of people’s supports including Hiroshi Tsunoda, Saeko Fredj Oba, Renat Piazza, Marina’s family who had Konno as a home stay. And of course, it came to happen because of everyone’s daily support such as supporting members of the Let’s Talk Foundation, all the members and partners. The visit to Barcelona was a visit that supported a lot of people, I don’t even know who to thank, there are so many. I would like to focus on overseas dispatching to utilize the English Reading Club and participant’s efforts and not just ‘an overseas trip gift for people who suffered in the Tohoku affected area’ (that’s also a good thing but..) and progress the “Let’s Talk Ambassador” program. There may not be an effect of connecting regions straight away, but we would like to build connections with the actual situation, truth, reliance, love and continuity. Thank you in advance for supporting us in the future.